I was lucky enough this week to visit the brilliant Make Do and Mend shop and workshop venue in Chelmsford! 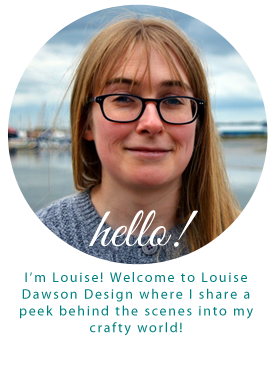 I am also lucky enough to now have a cabinet space in the shop for Louise Dawson Design jewellery, alongside the work of some very talented Designer Makers. It's a lovely shop, and the workshop program is really extensive, ranging from beginners knitting to Book Binding and Screen Printing and lots lots more in between! I think that the local area is so lucky to have a place like this that offers the chance to learn new skills and encourages a return to the ethos of days gone by- creating as much as possible by hand and making things that will last forever. In this age of fast, throwaway fashion, it's a breath of fresh air and I can't wait to book myself up on some workshops and learn something new myself! I love the quirky decoration in the shop! 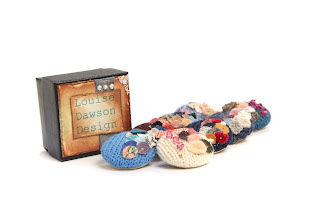 As if lovely handmade pieces and workshops weren't enough, you can also buy yarns and haberdashery at Make Do and Mend! Ok, so I admit it doesn't look very photogenic but it tasted good! I've also been enjoying trying out some new recipes! I'd seen something similar to this in a magazine recently, so when my Gran gave me some home grown Rhubarb I knew just what I wanted to do with it! It's basically a straight forward Rhubarb crumble, except that you pour custard over the stewed fruit before adding the crumble top and baking. I bought fresh custard but now I know it works I will make custard from scratch. I'm a real pudding person and I can thoroughly recommend trying this one! Although I've been knitting since I was five I've never learnt to Crochet, instead using my made up Crochet method, which is joined up chain stitch (great for ethereal effect in my textile hangings but lacking structure for practical use). However, working in the Wool Room at work I've been inspired to learn, especially after discovering Attic 24 (if you love Crochet, colour and craft do check it out, it's a beautiful blog). A lovely friend of mine has been teaching me to Crochet properly and I'm starting my Crochet education with a giant Granny Square made in a combination of Rico Pure Wool DK and Sublime Baby Cashmerino Silk DK- it's going to be a blanket for my niece! I'll keep you updated on the progress as I keep learning! I'd love to incorporate it into a future jewellery collection, there are lots of exciting possibilities! I love the portability of Crochet- I'ts handy to keep a project in your bag for when you have a spare moment, like on your lunch break on a bench in the sun! It looks a little wonky but blocking will sort that out!